I only teach a few workshops each year. The only workshops I teach which are available to the general public are three times a year at: ‘Knuston Hall ’ in Northamptonshire, and biannually at ‘Lanchester ’ in County Durham. 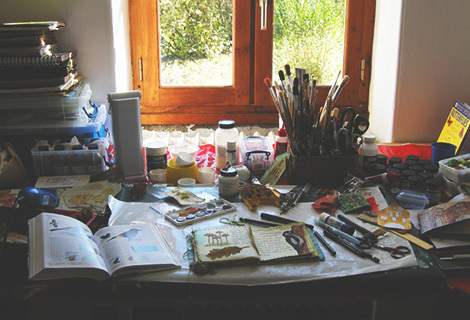 I also teach workshops in my studio at my home in Kent (maximum two people). For Groups and Guilds: I have some availability in 2019 and some availability in 2020. At my workshops, students learn how to construct books from scratch using very basic materials. They produce decorative, unique covers and pages with stitched embellishment. Various binding and fastening methods are covered along with guidelines for filling books.